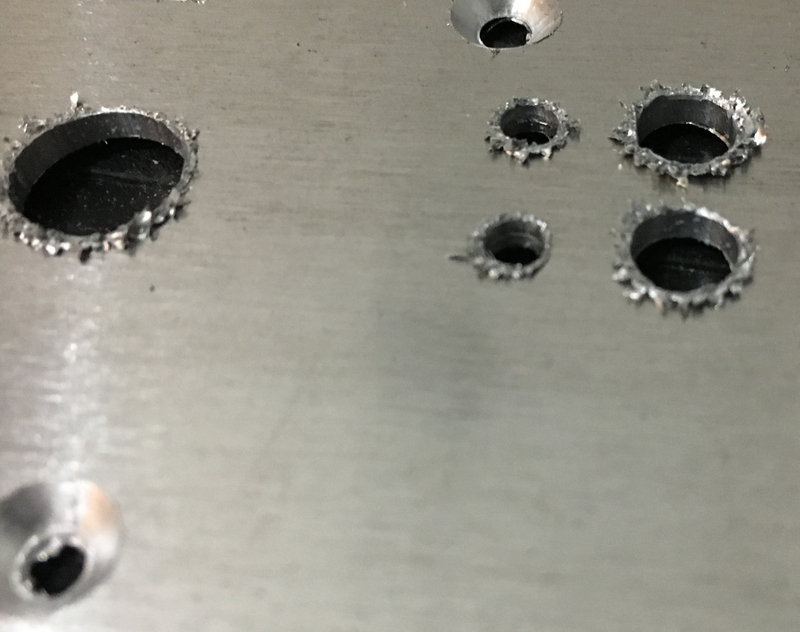 Aluminum cut was good, now bad, any advice? Hi, I’m cutting an aluminum part from 6061, .063" sheet. I did several test pieces to dial in speeds/feeds/DOC, and once I got everything sorted out the results were excellent. I am cutting mostly with a 1/8" flat endmill, it’s the carbide 3d #102. I ended up doing almost exactly what was recommended in the wiki – rough passes .3mm DOC, dewalt speed 1.5, 700mm/min feed, finish passes were .5mm DOC, dewalt speed 1.5, 700mm/min feed. The only set up change was switching from double-sided tape to masking tape/CA glue. I made that change both for removal/clean up ease and because the double-sided tape seemed to compress a tiny bit at times. I can’t imagine that would be the cause of this, if anything it was much more solid, but I guess I can’t rule it out. Thought I’d see if anyone had thoughts before trying again and eating another piece of stock. Any advice would be very much appreciated! Perhaps the bit is dull? Does it look the same with a different one? 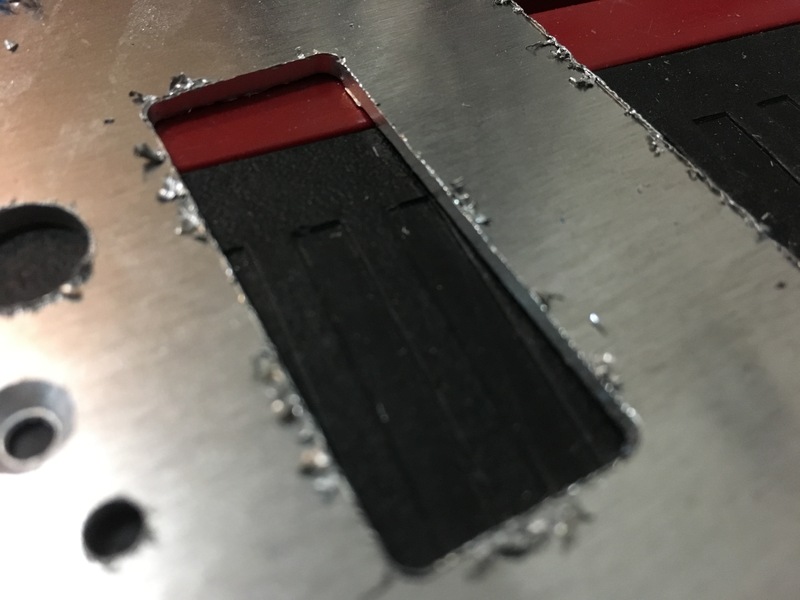 When milling holes in aluminium you need to use a slower feed rate - because you are going over a much smaller surface area there is allot less moment which increases heat build up - this can lead to rougher cuts and the results you see. Check the endmill under magnification - it’s likely gummed up or has a broken edge. The other recommendations here about feed and speed are right on as well. Thanks for the ideas everyone. I ordered some of the zrn coated endmills, and I’ll start over with feeds and speeds while I wait for them. Hopefully will have good results to report back soon. For the sake of anyone like me who uses these threads for research, I’ll report my findings here. I never achieved quite as perfect a cut in as short a time as the first several pieces; probably there were a number of good luck factors involved there. 1/8" 2 flute Zrn coated cutter (carbide3d #102Z). 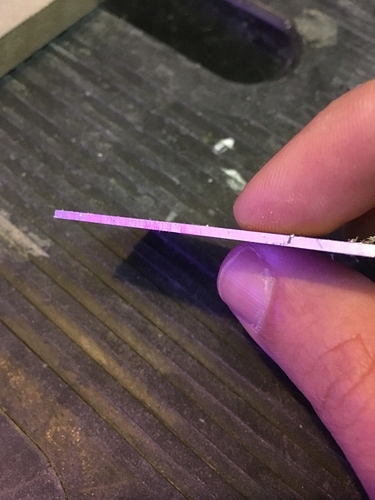 From what I can tell the coating doesn’t make a ton of difference in cut results, but they seem more forgiving about slightly imperfect cutting parameters. Avoid slots at all costs! WD40 is required for me, sadly. Maybe this means I don’t have stuff dialed in exactly right. I hate this, it’s a mess and means watching like a hawk the whole time, but for now I can live with it. Workholding is both critical and difficult with stock this thin. For my part, the choices are either use tape, or spend tons of extra time doing holes a couple at a time and moving bolts/clamps. The good news is that the Zrn cutters seem to be slippery enough that tape doesn’t stick if you happen to contact it. Here’s a pic of results with this formula. I’m pretty satisfied with it. Note the obvious tool marks on the edge; these get additional processing so I’m not spending time on finishing passes.